CoolBoard used on our Disc has the same benefits of the tradition wobble board, and adds some important extras to the old favorite. Wobble boards have been the physiotherapists’ staple for balance, lower limb control, proprioception and ankle flexibility for injury rehabilitation and sports conditioning. The design hasn’t changed much in the 70 or so years they have been around. Traditional wobble boards are simple and affordable. Accessible to all, CoolBoard is the most progressive wobble board available. Get the Beginner Package or optional Easy Start Balance Disc for the easiest entry into balance exercise. What makes CoolBoard the world’s best wobble board? 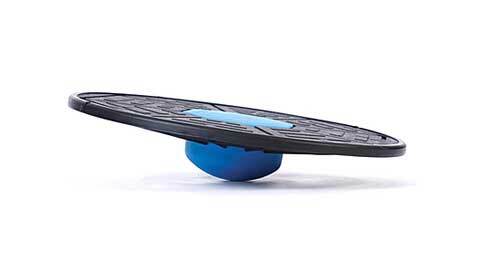 We’ve evolved the wobble board, extending the usefulness, effectiveness and the enjoyment so that everyone can benefit from balance training and instability exercises. You choose where your feet go, you choose your level of challenge, you use it where you want to, watching telly or in the garden, and you get balancing. CoolBoard looks fun to use and it is, simple. It has an easy enjoyable feel to it, enticing you back for another go. Now your previously tedious physiotherapy or exercise regime is a whole lot more appealing, making your recovery and fitness goals more achievable. The movement of CoolBoard Wobble Board is fully adjustable, the inflation of the Disc simultaneously adjusts height and tilt angle, as well as how stable / nimble it is. This makes a big difference in use, it aids initial confidence and allows you to progress as your confidence and skills improve. Inflation is easily and quickly adjusted by mouth. 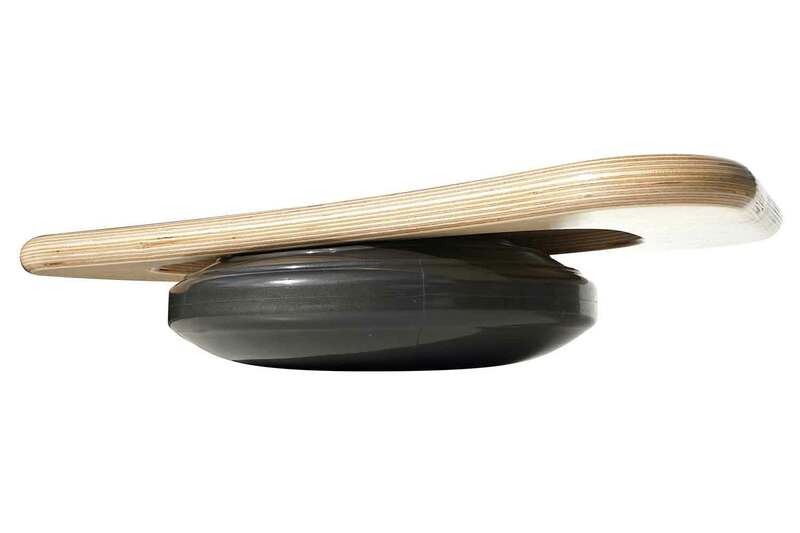 The stability of traditional wobble boards is fixed, and only a few allow the height / tilt angle to be adjusted. Limited or no adjustment often means it is too easy or too difficult to use, and inhibits progression. 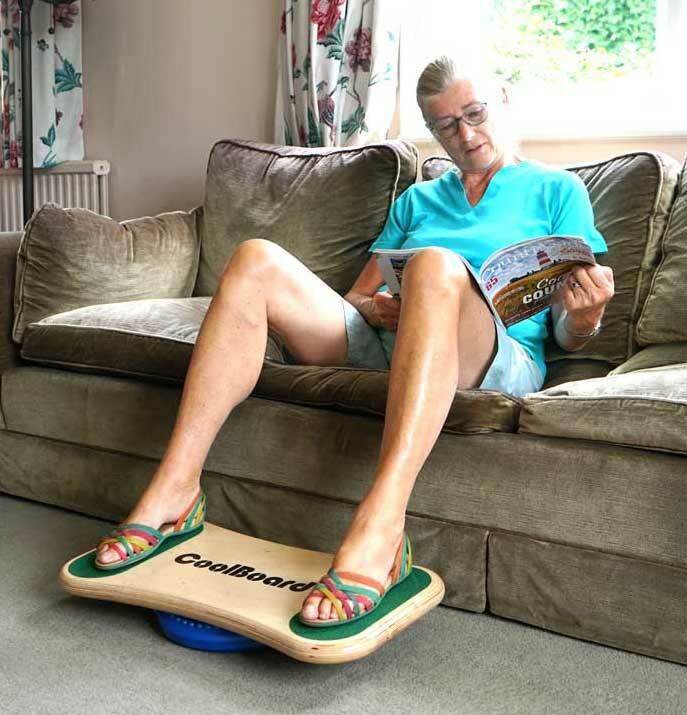 CoolBoard is designed to give a rock solid confidence inspiring balance platform. 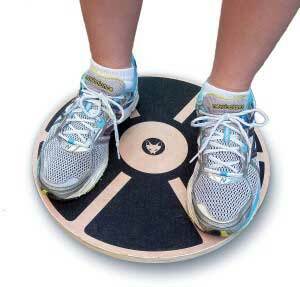 Being round and quite small the traditional wobble board can feel a bit cramped, with feet feeling too close together or feet not being fully supported, cue overhanging toes! CoolBoard offers a nice wide stance with plenty of room to choose where you place your feet while fully supporting both feet. You can still place your foot centrally for one footed work. Having edges rather than being round, CoolBoard also offers a stable starting position, adding to your confidence, rather than wanting to move before you’ve even started. Another fantastic benefit of having a good sized board and full adjustability is that exercising with your CoolBoard is much more appealing. Being able to place your hands further apart gives you more control and the thicker rounded edges are far nicer to hold on to. 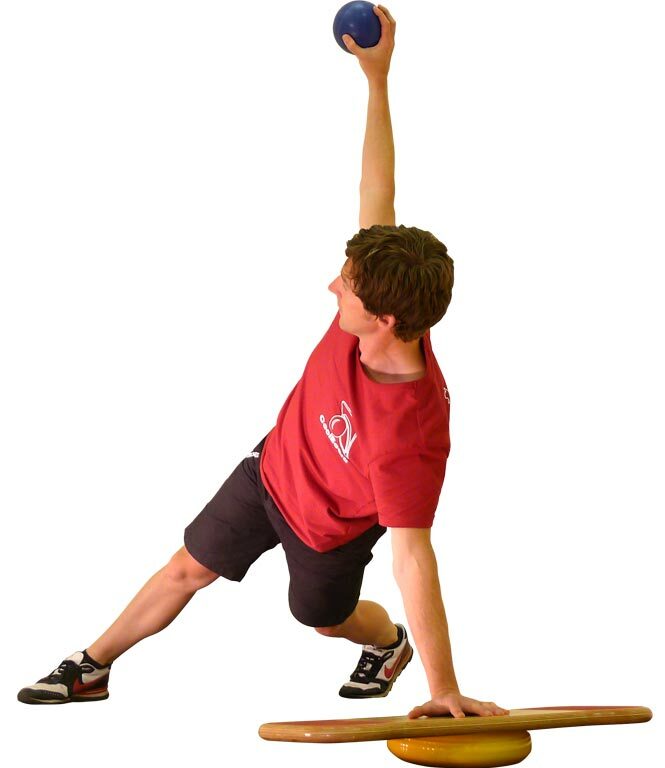 This also gives many more options for exercises, and almost all of our exercises can be done on the Disc, just as they are on the Ball. Use it standing, or sitting, and for exercises. Use it at home, in the office, at your standing desk, outside, and take it on holiday with you. The same can be said for any wobble board, but being more fun and useful means you’re more likely to use it if its a CoolBoard. 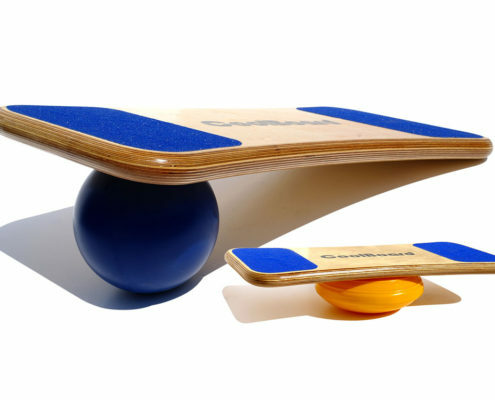 By having a Disc and a Ball, CoolBoard is both a wobble board and a balance board. So if you ever want to progress up to full 3D movement you can. The board is the same whichever package you go for, so you can add a Ball in the future. This is something no other wobble board can do! It means that with one product – CoolBoard – we help train our Olympians whilst also helping people in wheelchairs or with multiple sclerosis to increase strength and flexibility of movement for a better quality of life. Balance training and instability exercises are vital to everybodys’ quality of life, and CoolBoard makes those benefits available to everybody. Result – CoolBoard is the best wobble board!